The word “shedrub” in Ka-Nying Shedrub Ling encompasses study and practice, and these two activities essentially capture the focus of most monastic pursuits. From the time of Shakyamuni Buddha, monastic communities have been places of learning that engage fundamental questions of existence and meaning. This knowledge is brought into the realm of experience and action through specialized meditation techniques that have been developed and preserved throughout the tradition’s 2,500 year history. 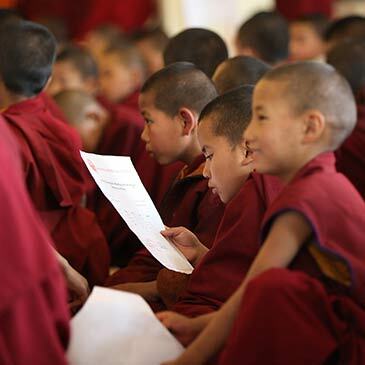 Although various forms of guidance and instruction play an active role throughout the entire life of a monastic, the formalized education offered in the monasteries can be broken down into primary and secondary education, and ‘shedra’ or monastic college. Upon first entering the monastery, young monks typically begin their new life’s journey by acquiring the basic knowledge and skills that will be most needed throughout their future spiritual and worldly endeavors. 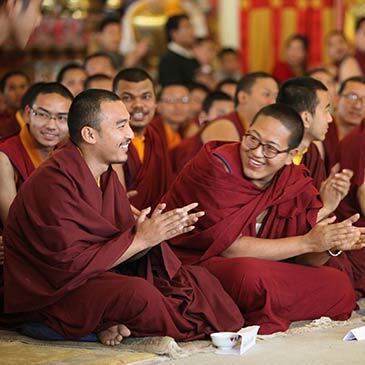 Monks who successfully complete their primary and secondary education most frequently elect to join the Sangye Yeshe Shedra for the study of the great classics of Buddhist scripture and philosophy.